Remove the Pit Ham from the packaging and place it on the smoker. It’s that easy, no seasoning or rub required. You can cut slits into the outer skin if you like but I like the presentation without it. It will take about 3 ½ hours for the Pit ham to reach 140⁰ internal. After 1 hour of smoking it’s a good idea to use a probe thermometer to monitor the temps, and just keep the cooking temperature steady. I like to use the DOT (probe thermometer). To really set this ham off I use a glaze at the very end. Add all of the ingredients in a bowl and whisk. Pour into a squeeze bottle for use. When the Pit Ham reaches 125⁰-130⁰ internal, it’s time to glaze. Squirt or brush the glaze over the top and sides of the Ham. The heat will melt the glaze and cause it to run all over the outside. The glaze needs to cook on for 30-45 min and at this point the Pit Ham should be 140⁰. Once it gets close go ahead and get it off the smoker. You don’t want to go over 140 because it can dry the ham out. I say it’s best to be a few degrees under here than over. 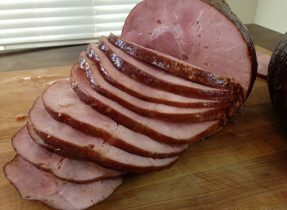 Let the Pit Ham rest a few minutes before slicing for a juicer product. This is one ham that you can wait to carve at the table. All you need is a long blade and you’ll have picture perfect slices waiting to go on people’s plates.